This recent discovery could easily become a staple at our house due not only to its rich taste but also its incredible price point. HANDS can usually be found for a little less than $10.00. I’ve been lucky enough to find it priced as low as $8.99 at one of my favorite shops in Asheville NC; The Asheville Wine Market. I have also found it in the $10-11.00 range at local wine stores in Florida. Originally introduced to this lovely wine by a neighbor and friend I have gone out of my way to buy it when I come across it. It is reliable and a great everyday wine. Even better it can be shared with others without any concern over its affordability. Having said that I will have to share this with my wine snobbier friends [ OK friend non-plural 🙂 ] and see if I can actually get them to accept the fact once and for all that there are good $10.00 wines out there to be had. I was not able to find much information about this particular wine on-line. That said, it does come from the wine region of Robertson; a South African up and coming wine region once known for its thoroughbred horses and now credited with producing good quality well priced wines. Should you go shopping for this one in particular do not be confused with all the different “HANDS” out there; 2 Hands, 14 hands, Purple Hands etc…. Lets give HANDS a much deserved hand, SALUD! My notes: sweet dark fruit (raspberry, blackberry, plum, cherry) tobacco, cedar, leather, coffee, pepper, minerality, earthy, GREAT with dark chocolate! 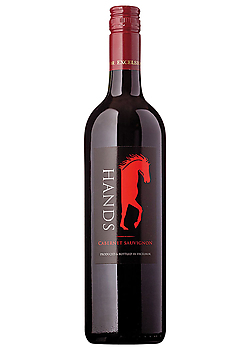 South Africa produced in the Robertson Valley by Excelsior, this Cabernet offers bold, intense black currant and plum flavors framed with toasty oak. It finishes smoothly. Enjoy it with red meats and hearty dishes. Thanks for the tip as bang for the buck is good. My local online resource doesn’t handle this, but I will be watching for it. This sounds excellent not only for taste but, also for the value! I will have to search and see if this can be located here in Alabama. Good luck with your search! Thanks for visiting. Sounds delicious from the notes you listed and like the horse label too! Merci for visiting my blog and wishing you all the best for yours!